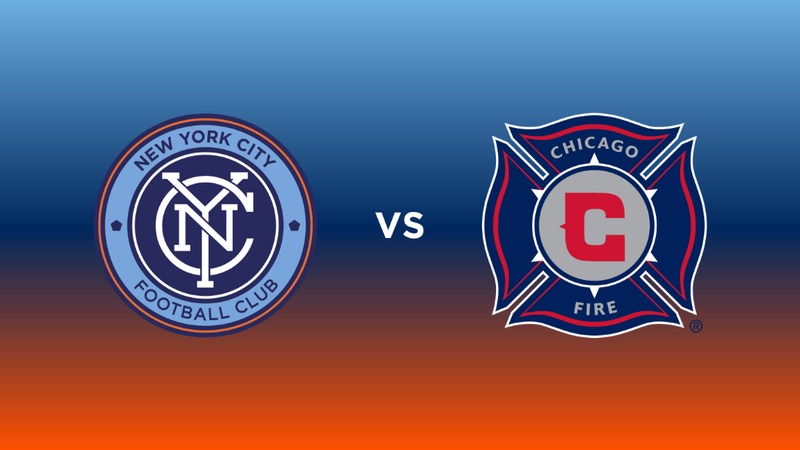 NEW YORK CITY, N.Y. – New York City FC welcomed Eastern Conference powerhouse Chicago Fire SC into Yankee Stadium Saturday afternoon. Let’s take a look at the recap. In our pre-match primer, we had highlighted the battle between Yangel Herrera and Bastian Schweinsteiger as one to watch throughout the course of this match. Well, we got it for about twelve minutes. Herrera was clearly getting the best of Schweinsteiger, not shying away from contact and actively trying to pick his pocket and turn defense into attack. Just four minutes in, Herrera took the ball right off of the Chicago DP and bee-lined for the box, only to be taken down without a whistle. Four minutes later, Herrera went in hard on Joao Meira and got his first yellow from referee Allen Chapman. The tackle was at least 50-50 in terms of it’s card-worthiness, but eight minutes into the match seems a bit harsh. Herrera has an aggressive style of play about him to begin with, but at least give a warning first! It could be that the Venezuelan was mouthing off after not receiving the penalty call earlier. Yet another four minutes pass by and Herrera once again tried to make a move on Schweinsteiger in the midfield. He completed the tackle (albeit aggressively) and the German went down in the circle. Chapman stopped play and after come consideration decided to show Herrera a second yellow, making it two within a span of four minutes (and only twelve minutes into the match). 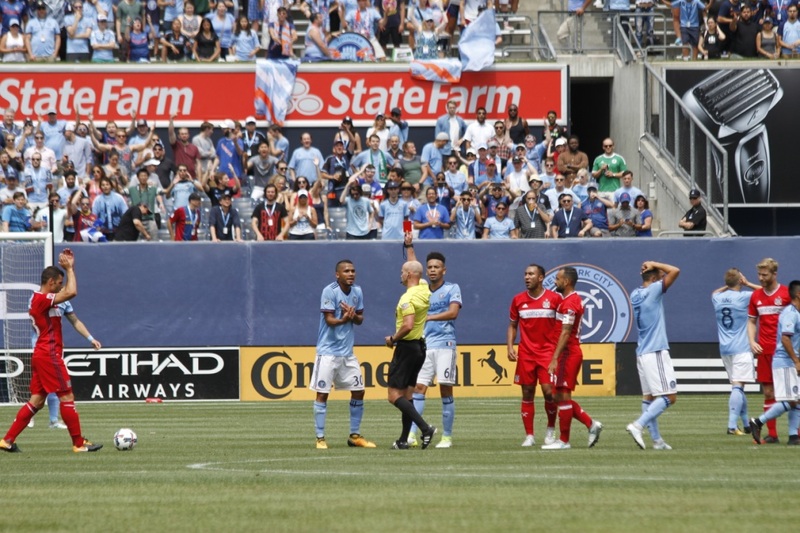 Despite the sending off, NYCFC showed a fantastic level of poise and concentration – something Patrick Vieira has been critical of in the past. When on defense, City didn’t bite on anything they didn’t have to, maintained their shape (now a 4-4-1 with Herrera off) and defended well considering the quality of their opponent. A scary moment came in the 33rd minute. On a Chicago corner, Ben Sweat collided with Frederic Brillant, with the former going down seemingly unresponsive. Team doctors were dispatched and after some time Sweat sat up and walked off under his own power. He was replaced by Mikey Lopez. Standing out in the first half was Jon Lewis, getting his first start for the club and for his career. Lewis showed electric ability to penetrate Chicago’s defense and create opportunities both for himself and David Villa. Both of his shots ended up being a little too weak to challenge Matt Lampson. Alex Ring also stepped up (if that’s possible) in Herrera’s absence to play box-to-box. The man manages to be everywhere at once. As it turns out, the Herrera red card would only be the beginning of the dramatic turns in this match. In what could have been a foreboding move, David Accam came on for Solignac right at the half. How did NYCFC respond? With Lewis putting himself in fantastic position and putting in a beautiful ball that Villa would strike – on the volley – past Lampson to open the scoring. 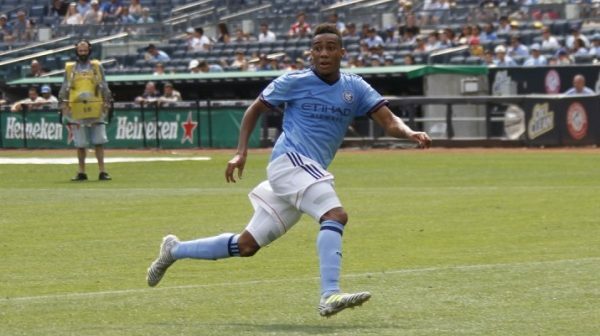 A 10-man NYCFC would go ahead against a team that many have as MLS Cup finalists. Not three minutes later, on a free kick from Maxi Moralez, Brillant would get himself in the scoring column and put City up 2-0. It wasn’t a squeaky-clean strike, and the defender would end up taking a shin-guard to the face for his trouble. He would return to play shortly, however, despite it being his second blow to the head of the match. A quick four minutes later and Chicago would get one back. After a corner that NYCFC had trouble clearing cleanly, the ball rattled around a bit in front of the box. It would fall to the feet of Accam, who put it away off the crossbar. The rest of the half went back and forth, with each team getting good chances. Frankly, City was lucky to come away with the win in this one, as Chicago had multiple crosses dribble across the goal mouth with nobody close enough to put them away. The defensive organization in this match was fantastic. Being down a man to a team like Chicago is daunting, and the poise and cool attitude the Boys in Blue showed this afternoon is the kind of thing you expect to see from a side that should be challenging for the MLS Cup. Superb teamwork on the part of the back line, including Alex Ring, is what won City this match. It’s a sharp contrast to what we saw last match against Toronto. There was a disorganization – an almost-laziness – to the play Wednesday night. In a match that most people (this writer included) wrote off twelve minutes in, NYCFC showed what they are capable of doing when they need to. This match was going to be a defining moment for City no matter what the outcome was. I think this was a better outcome than anyone could have expected or hoped for. NYCFC’s next match is Sunday 7/30 at 2pm at BMO Field against Toronto.